CAVALIER SPECIALTY CLASS IN SHOW WINNER! TOY SPECIALTY CLASS IN SHOW WINNER! ALL BREEDS CLASS IN SHOW WINNER! His father *Chaser* - "BISS Ch Marcavan Storm Chaser"
cousin *Aria* - "CH Marcavan Pretty Little Liar"
and team mate *Zumba* - "BISS RUBIS Supreme Ch Marcavan Master The Look"
A Ruby dog of lovely size, another well coated dog, lovely rich rolour, lovely headpiece with dark eyes he had a well cushioned muzzle and enough fill under eyes. 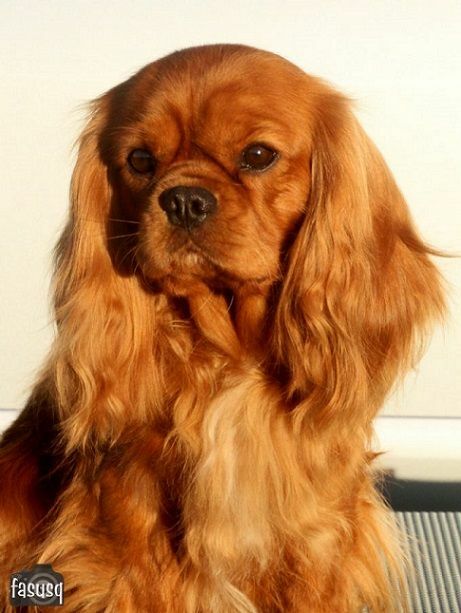 He had that happy Cavalier nature and showed well. Lovely angles front and rear and covered the ground well. Small Ruby dog that scores well on size and well-knit proportions. For a smaller dog he has a masculine head but s pronounced furrow tends to make his expression a little severe. Lovely eyes, well finished muzzle and broad top skull with a good ear set. Moderately angulated both front and rear but he is balanced and moves with purpose and has a co-ordinated footfall on the go round. Good development of rib cage. Good to see a tail well set on and carried as a natural extension of the top line. Good rich red colour but lacking the silky texture or affluence of furnishings. Cavalier Club of Qld 2013 - 1st in baby dog & opp Baby in show! 1. Fasusq Bittersweet Symphony – What a big name for such a little tyke! At only three months, this Ruby was well schooled and did an awesome job trotting around the ring. His front and rear angles were correct which allowed him to move out with reach and drive. Everything about this puppy was small but all in proportion. Beautiful head, large eyes. Rich, Ruby coloring. He was not impressed by the rain!